Always Nintendo: Koji­-san. Over the past year, many Mega Man fans have been scared because they feel as if the Mighty No. 9 franchise might take away Mega Man’s spotlight. Do you believe that the two franchises will be able to co­exist among each of the fanbases in the future? Or will it be complete and utter chaos? While a crossover between the two proprieties would be interesting, I believe this is something we won't be seeing for quite sometime. Mega Man still needs to find its footing, mind you. The franchise has been using other properties as a crutch for the past couple years. Meanwhile, Keiji Inafune, Comcept's head honcho, isn't exactly on speaking terms with Capcom. Not yet, at least. A few years down the road, Beck and Mega Man may share the same screen. But that true-blue crossover, I feel, will happen when several things align under the right climate. That could take time. For more Mighty No. 9 talk, you can read the full interview at Always Nintendo. Of course they can coexist, just like Mega Man, X, Volnutt, EXE, SF, ... 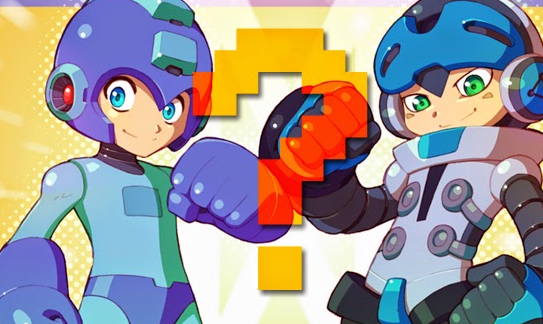 The problem is that Mega Man in general is kinda negleted by Capcom nowadays (Triple cancellation and crappy crossover) and their (good) recent appearances are in a NamcoxSegaxCapcom and Nintendo game. Well, let's get some crossover fanart out there! I know there are some fans out there who feel like this. They're conflicted about liking No9 when they've been lifelong MM fans. I spoke to Capcom's own Brelston at PAX last year and he mentioned this specifically. Like their loyalty to MM is somehow broken by being interested in No9. I guess I can understand some of that reasoning, but it doesn't feel that way to me at all. Both series can coexist, and it's been great to see MM fans get excited about No9. I'm sure they'd get along, so why can't the fanbases : ) Hopefully we do get that crossover someday soon. As a Mega Man fan, I'll admit that I feel like he's taking some of the blue bomber's glory. I have nothing against Number nine, in fact, I really like his design and look forward to getting the game when it comes out next year. However, I will always love Mega Man, and I don't think that Beck and his story will ever take the place of Mega Man and his story in the hearts of the true fans. And I'll admit, a crossover between both Mega Man and Mighty Number 9 would be epic!!! I've seen plenty of fanart of it already!